At twelve noon a Sunday or so ago, I was in Flushing, Queens. And, no, not at the Billie Jean King National Tennis Center. The Serena and Victoria slugfest would not start until later. No, I was slugging it out against a stiff headwind as I slowly made my way toward the JFK Triborough Bridge. I think you have to have three names for something to be named after you in Queens…. Meanwhile, an organization with three names—the International Olympic Committee (IOC) was whittling down its selection of three contenders in consideration for inclusion in the 2020 Summer Games to one. Squash, the sport I spend much of my non-working life playing, was one of them. I’ll be honest, I haven’t been thinking a lot about squash this past summer. With the exception of two brief heat waves, the weather was glorious in New York and I took full advantage of it—riding long distances on my bike and picking up my tennis racquet again after a three year hiatus. I took deep breaths of air tangy with just-mown grass and sat on my stoop late in the evening listening to the cricket chorus. Occasionally, I would venture inside to the white box and swing my squash racquet, but even the luxuriant rain-head showers at my club can’t rival the drama of an August downpour. Not that I haven’t felt guilty to be out gallivanting while squash has been in boot camp all summer—shining its shoes and putting its best faces forward. When I learned last May that it was on the ‘short list’ for the Games, I gave a cheer…but as summer wore on, I left it to the other blogs and squash sites to do the heavy lifting. I was too distracted by firefly nights and balmy beach days. Besides, squash is a winter sport for me; I needed an outdoor break. Squash could’ve used a break more than I. It was up against the big boys: wrestling—the sport of the Greek gods, and baseball (along with softball)—America’s pastime. Other articles have outlined the odds much better than I ever will, but to many of us squash players, going head to head with an original Olympic sport felt like a farce. Yes, wrestling was tossed out back in February, but now that it was back on the short-list, it seemed more like detention or a time-out. Go sit in the corner, and when you can figure out how to play better you can come out. While I wished on every star and birthday candle that squash would prevail, I held not so much hope. As usual, September days came too soon and I spent the long Labor Day holiday cramming in as much outdoor fun as possible—hiking up mountains, swimming in rivers, biking country roads, and hitting the tennis ball until I could barely see it in the dusky end-of-summer evenings. When I got back to the confines of my New York City abode, I was surprised to see that the IOC decision was now only a mere few days away. It seemed fitting to me, however, that when the decision was to be announced—noon on Sunday, September 8th—that I’d be participating in another activity I loved, the NYC Century. I had no desire to wake up on a beautiful early autumn day and worry half of it away. What better way to distract myself then to go for a nice nine hour bike ride? So instead of my usual week-end sleep-in, I rose at six and two of my best friends and I were on the road by seven, joining 8,000 other early riders, pedaling through sleepy Brooklyn streets toward the Verrazano Bridge, Coney Island, and – for us 75 milers – the sparkling Jamaica Bay. It’s actually somewhat comforting to know that extreme thirst, ravenous hunger, and complete exhaustion can pretty much wipe out all other concerns. Not that all three of these struck at once, but when I wasn’t trying to catch up to my much fleeter friends (matching bike jerseys must be the advantage? ), I alternated between watching the extremely varied outer-borough landscape roll by; dodging potholes, glass, and other unsavory street detritus; and doing mental math as to when we might arrive at the next rest stop. It was only when I began to hear the roar of low flying jets as they flew over Flushing Bay on their way to land at LaGuardia, that my brain made its loopy connection from Flushing to tennis to squash, and I thought to look at my watch. It was after twelve, and a whole bunch of my friends were either really happy or really sad. I thought about stopping to check my phone, but the fear of losing sight of my friends who had my tire levers (and the ability to fix a dreaded flat) was greater than my curiosity. I kept pedaling. I did continue to think about squash, however. Like most children raised in a sports consumed family, I was enthralled by the Olympics, was in awe of the athletes, and was deeply moved by the emotional highs and lows of all-out competition and the devotion it took each athlete to get there. While I never aspired, myself, to be of that rare athletic ilk, I have enough experience with competition to know how extremely good and bad you can feel. And to be competing in the Olympics can only be the pinnacle of those feelings. So . . . to be a professional sportsman/woman, to devote constant time and energy to your training, and then to have your sport denied entrance to this apex of competition must be devastating. No matter what anyone says. 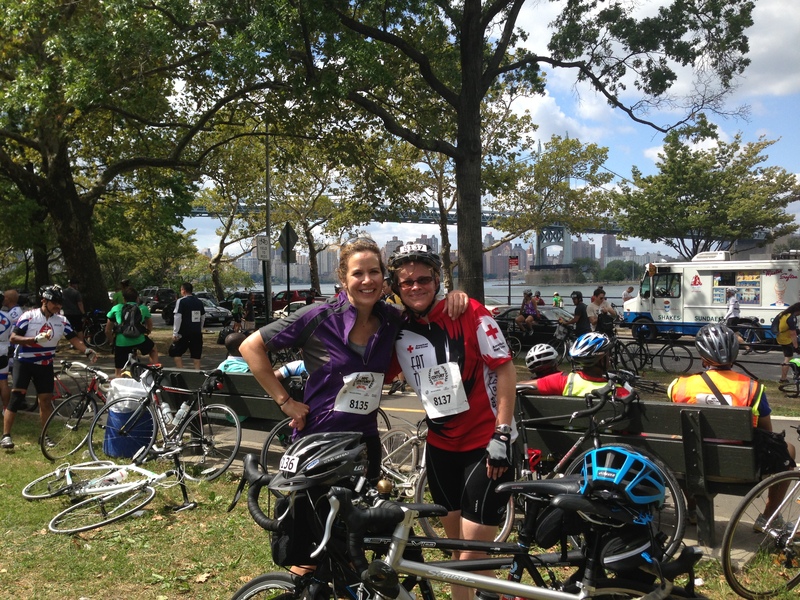 at astoria park, queens- 55 miles down, 20 to go…. I actually put off checking the news on my phone until I got home. Why potentially ruin a beautiful day? And it was spectacular. Riding along the East River to Astoria Park in Queens—fluffy clouds drifting by the RFK bridge, the skyscrapers of Manhattan looking friendly and not so looming in the distance—made the fatigue of 55+ miles fade fleetingly away. 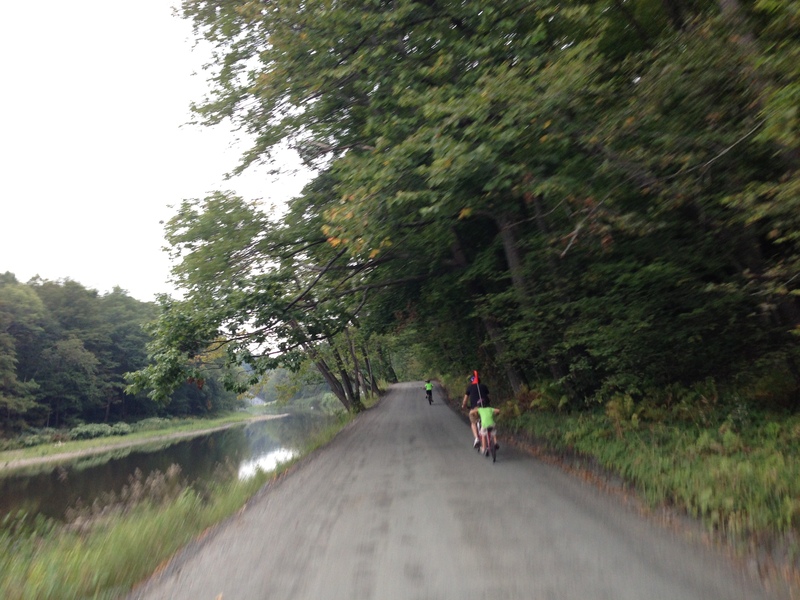 I considered getting off my bike to take a photo, but that would’ve meant getting back on….so I didn’t. After a break for extra electrolytes at the Astoria Park rest stop, my friends and I decided to blow through the Central Park Finish line (ours was Prospect Park in Brooklyn), continue down through the park by the reservoir and then cut over to the West Side bike path to get downtown to our own designated fuel stop, a pizzeria with sidewalk seating at the 70 mile mark in SoHo. I’d learned during last year’s ride that the ‘official’ route via Manhattan avenues might be great at 7 a.m. on a Sunday morning, but were decidedly not in the mid-afternoon. This wasn’t a race and as long as we logged 75 miles on our bike computers, we were all fine with that. Although I learned this time that a pint and a half of Blue Moon might not be best mixed with 70 mile legs when you still have 5 to go, but I took it slow, if not steady, and got back to Brooklyn intact. Which is where I finally checked Facebook. And learned the very bad news. For squash and baseball/softball, that is. I’m sure all wrestlers and wrestling fans were now having a great day. Maybe because I had, up til now, had a very good day myself . . . maybe because my friends, who were on their way to meet me for post-ride couch surfing, didn’t play squash and weren’t about to share in my misery . . . maybe because the women’s finals of the U.S. Tennis Open were about begin, I wasn’t about to let some bad news get the best of my good day. Plus, with thigh and glute muscles about as sore as they’d ever been, I just wanted to sink into my nice soft sofa, watch Serena go for her 17th slam, and have a happy if achy afternoon. Which I did, my friends did, and Serena probably did most of all. It’s now a week later as I write this. I haven’t had the heart to read any of the articles reacting to the decision, although eventually I will. The whole thing just seems a damn shame. Why take out a sport, get a bunch of other sports and athletes’ hopes up, only to put that sport back in? Yeah, maybe wrestling needed a wake-up call, but at the expense of all the other hopefuls? Couldn’t there have been a better way? a vision of a future Olympic greeting….. In the scheme of things, there are many more important matters at stake in this complicated world. Lives in Syria, and crises in Egypt, and turmoil too many places to name. Fires and floods and firearms destroying homes and livelihoods and families. And as I pedaled under blue skies through Brooklyn, I’m sure I passed by many whose days were not so sunny. So, in some ways, it doesn’t feel right to get worked up about sports. But . . . on the other hand, what would life be without them? Even if you don’t regularly play or watch one, most people I know would be pretty upset if the Olympics closed up shop. In a world of often not-so-great news, every two years they provide two weeks of very good news, and a welcome opportunity for people to put aside differences great and small and cheer for a favorite athlete or team as they compete on the world’s field. Someday, somehow, I hope our favorite athletes will also meet on the world’s squash court. This entry was posted in cycling, squash and tagged cycling, nyc, olympics, squash, tennis. Bookmark the permalink. Nice reflection…. I actually spent that day playing tennis, not bearing to look at what i knew would be bad news until the end of the match. I was instantly irritated, but the three hours of tennis I had just played helped calm my desire to attack….. I’ve recovered since, i’m happy to report. The alcohol helped, I might add. Ah, yes. I can thank Blue Moon, Sixpoint American Pale Ale, and a growler of Red Thunder for mellowing my ire…! 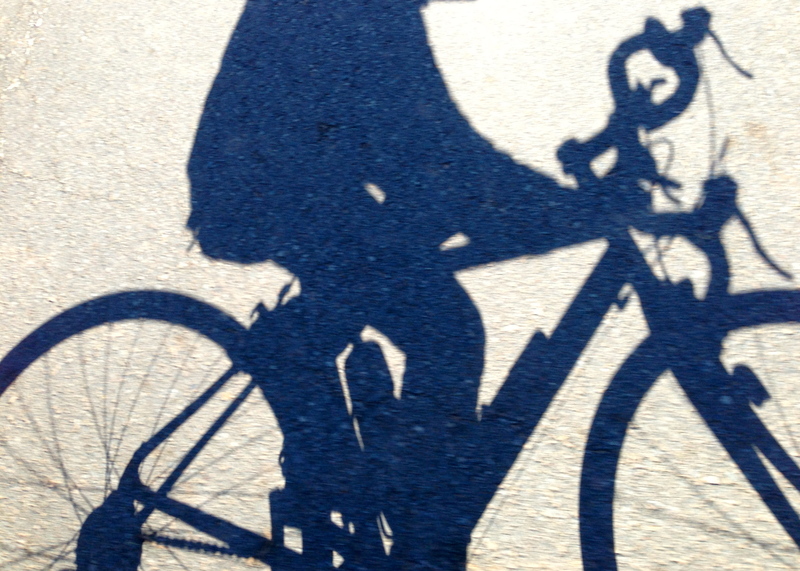 Biking, squash, tennis, wrestling, Olympics, friends, life…thanks for putting it all together. And it’s kind of ironic that the first novel I edited was all about wrestling! It’s still one of my favorites: Wrestling Sturbridge, if anyone wants to look it up…. Shame on the IOC- They missed the mark. We (squash) should march on and grow our sport and not spend any more time and resources on the Olympics. Thanks for sharing your great day- I spent the day playing 36 holes of golf. Yes, I think it’s VERY important that we not let this get us down. I still hold out hope that the IOC will get it right one day, and in the meantime we can continue to show the world what they’re missing!